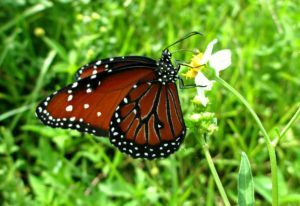 Most people are well aware that Monarch butterflies (Danaus plexippus) will soon begin their southern migration from United States and Canada to Mexico. But they are not the only migrants. 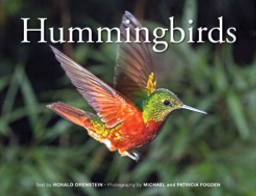 Hummingbirds also travel to Central America and they, too, have started their journey south. Male Ruby-Throated Hummingbird (Archilochus colubris). Photo Copyright © by Brenda Hawkins. Used with permission. Approximate range/distribution map of the Ruby-Throated Hummingbird. Green indicates the summer-only range, blue indicates the winter-only range, and orange indicates areas through which the species will pass during migratory activity. In the weeks before hummingbirds migrate, they start to intensely feed in an attempt to gain weight and fat. This is called hyperphagia. A female might put on 25-40% more weight while a smaller male might double its weight. 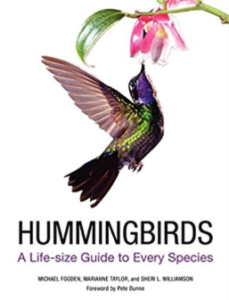 Hummingbirds consume 50% of their weight in sugar each day from flower nectar and hummingbird feeders, with insects providing the remainder of their diet. You can help migrating hummingbirds by planting flowers that have high nectar content. 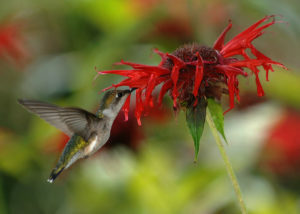 Hummingbirds are especially attracted to tubular flowers such as Coral Honeysuckle, Fushia, Daylilies, Bee Balm, Cardinal Flowers, Salvias, and Petunias. They are also attracted to Coral Bells, Larkspur, Columbines, Coneflowers, and Lantanas. 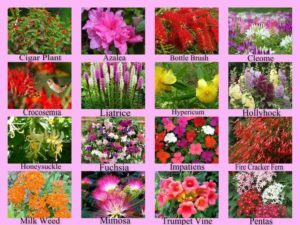 Notice that many of these flowers also attract butterflies! 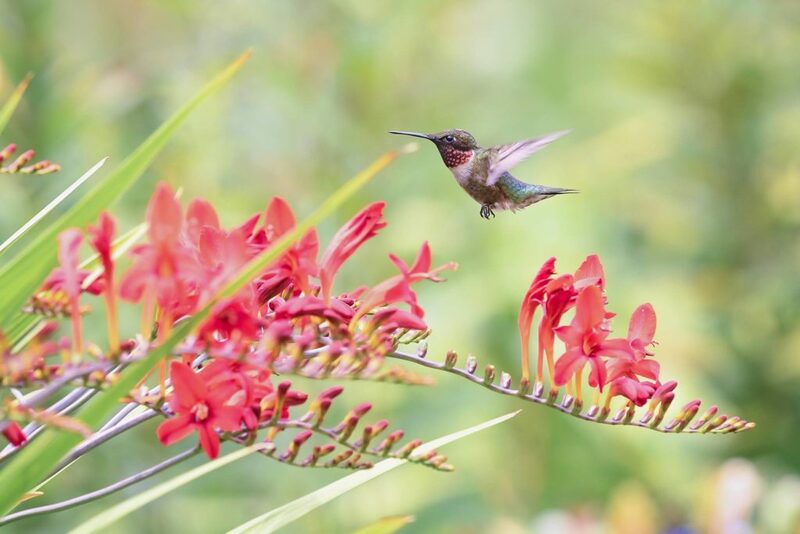 The best hummingbird flowers produce large amounts of nectar for the birds to drink, are shaped for hummingbirds’ long bills so they can sip the nectar effectively, and feature bright colors, including red shades, to catch hummingbirds’ attention. 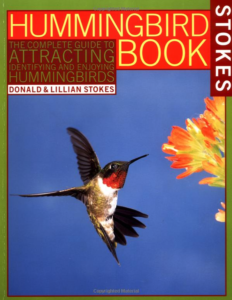 You can also help migrating hummingbirds by putting out several Hummingbird feeders. Hummingbirds tend to be very territorial and do not like to share. Make sugar water mixtures with about one-quarter cup of sugar per cup of water. Food coloring is unnecessary; table sugar is the best choice. Change the water before it grows cloudy or discolored and remember that during hot weather, sugar water ferments rapidly to produce toxic alcohol. 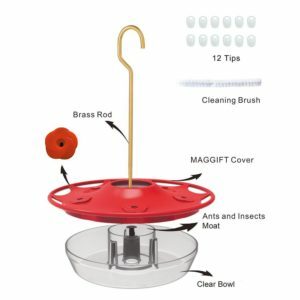 Keeping your feeders clean and hygienic is a vital aspect of feeding the birds. Not only are hummers more likely to imbibe from a clean feeding station, but it’s healthier for them as well. 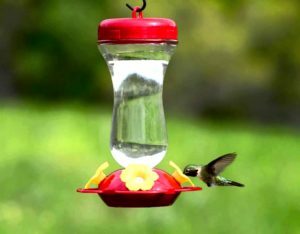 Most hummingbirds would rather go without food than drink nectar that has gone bad, so it’s important to keep your feeder clean if you want to continue enjoying their visits. If ants are a problem, use an ant guard to keep them off of the feeder. It is not recommended to place petroleum jelly or oil on the poles. 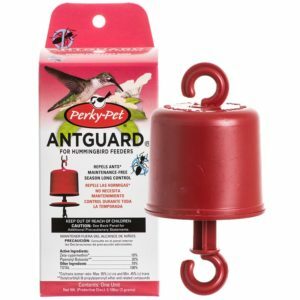 This is the best way to keep pesky ants away from the hummingbird feeders. Click Here or on the photo for a closer look and to see other types of ant guards. 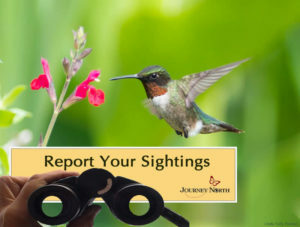 Help track hummingbirds as they travel to their wintering grounds by becoming a citizen scientist and reporting hummingbird sightings at Journey North. 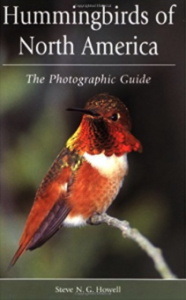 You can report Hummingbird sightings at Journey North. Click Here or on the photo for details. And while you are helping out migrating hummingbirds you will also be helping migrating Monarch butterflies! Monarch butterfly nectaring on a hummingbird feeder in Raleigh, North Carolina, USA. The butterfly stayed at the feeder for more than a minute, giving me plenty of time to take this photo. Here is my favorite hummingbird feeder. This is so easy to clean and maintain.Click Here or on the photo for details.. 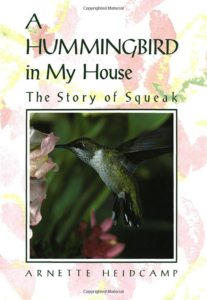 Here are five of my favorite hummingbird books. Click on each photo or title for complete details. Do You Have Parsley Worms? Posted on 16 August 2017 | Comments Off on Do You Have Parsley Worms? If you are growing herbs such as parsley, fennel, carrots, radishes, celery or dill in your garden then you most likely have encountered what some call parsley worms. 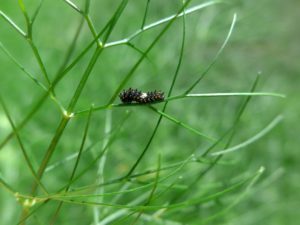 The first instar of the Eastern Black Swallowtail (Papilio polyxenes) larva on dill. 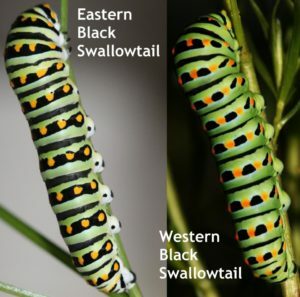 The difference between Eastern And Western Swallowtails is subtle. Photo by Todd Stout of Raising Butterflies. Photo used with permission. 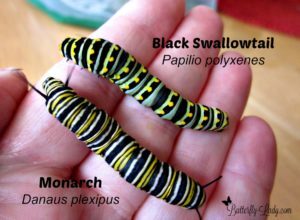 Although many may regard these “worms” as a nuisance, they should be treated with care as these “worms” are actually the caterpillars of the Black Swallowtail (Papilio polyxenes) or Anise Swallowtail (Papilio zelicaon) butterflies. These butterflies not only grace your garden with their beauty, but they are also important pollinators. The beautiful Eastern Black Swallowtail (Papilio polyxenes) including some of its larval host plants. 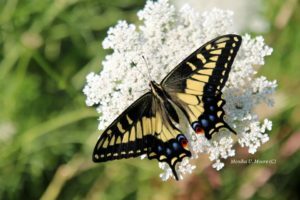 The Anise Swallowtail (Papilio zelicaon) is a common swallowtail butterfly of western North America. Photo by California Butterfly Lady, Monika Moore. Used with permission. Sometimes people confuse these caterpillars with Monarch caterpillars. They do resemble each other, but the big difference is Monarch caterpillars only eat milkweed. 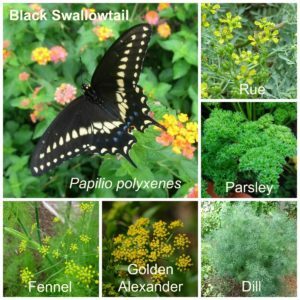 Black swallowtails eat plants from the Apiaceae or Umbelliferae family commonly known as the celery, carrot or parsley family. These two caterpillars look similar but have different diets. Monarchs will only feed on milkweeds while Black Swallowtail will eat a variety of herbs in the carrot family (Apiaceae). 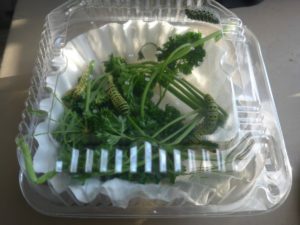 If you do not want the caterpillars eating your herbs, gather them up and place them in a container with some food. This will protect the vegetables and herbs you want to eat. 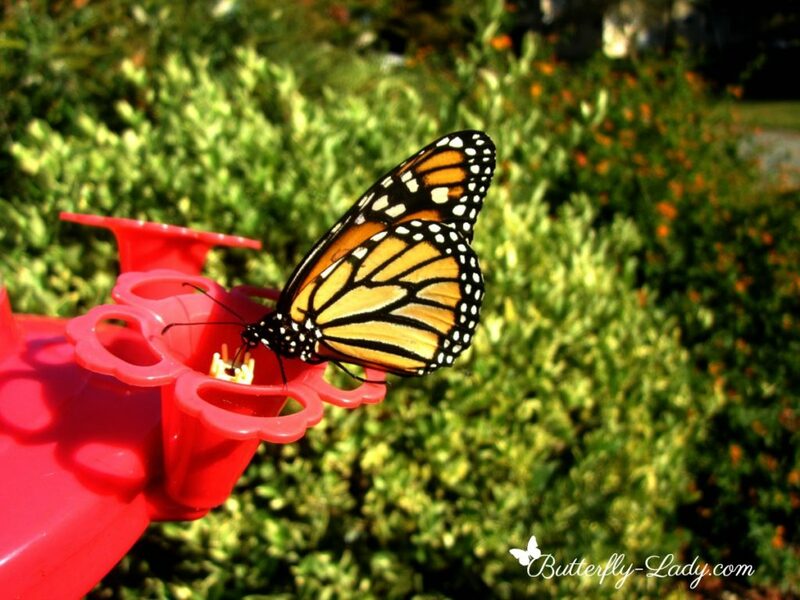 And once they become butterflies you can release them so they can pollinate your garden. 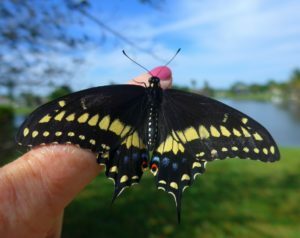 Releasing a new-born Black Swallowtail (Papilio polyxenes) butterfly brings beauty to the garden and joy to the heart! 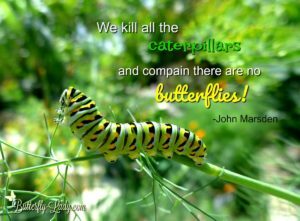 So if you want butterflies in your garden don’t kill the caterpillars! Comments Off on Do You Have Parsley Worms? 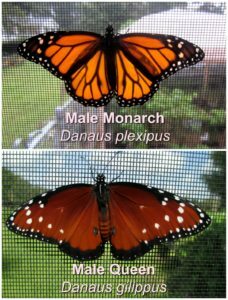 If you thought the Monarch (Danaus plexippus), was the only royal butterfly of North America you would be wrong. Another royal member, the Queen (Danaus gilippus) is a cousin to the Monarch and also adorns our gardens with its lovely orange wings. Queen nectaring on Tropical Milkweed (Asclepias curassavica). 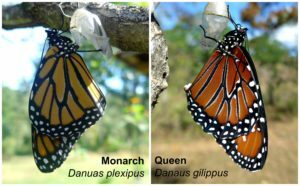 Just like the Monarch, the Queen uses Milkweed (Asclepias spp.) as a host plant for its caterpillars. The Queen is chiefly a tropical species. In the United States, it’s usually confined to the southern regions. It’s quite common in Florida and southern Georgia, as well as in the southern parts of Texas, California, and other states bordering Mexico, including Arizona and New Mexico. Periodically, a stray may be found in the Midwest. Because of climate change, they may even stray farther north as time goes on. The Queen’s favorite source of nectar is the flowers of Spanish Needle (Bidens pilosa). Other flowers they visit are Zinnias (Zinnia spp. ), Mexican Sunflowers (Tithonia spp. ), and Lantanas (Lantana camara). 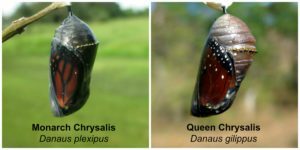 Queens and Monarchs are often mistaken for each other in their various life stages because of their resemblances. But if you look closely, it’s not that hard to tell the difference between Monarchs and Queens. Newly eclosed Monarch and Queen butterflies. Notice how much darker orange the Queen is compared to the Monarch. 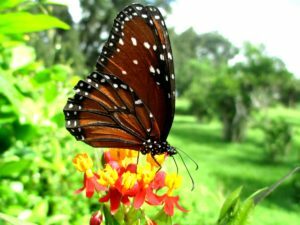 Like the Monarch, caterpillars of the Queen also feed on different species of Milkweeds. The larvae of the Queen butterfly have an extra set of filaments the soft horn-like structures on their topside. 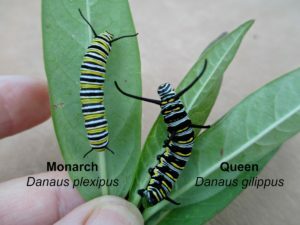 The Queen caterpillar, similar to the Monarch, has black, yellow, and white stripes, but the pattern varies. 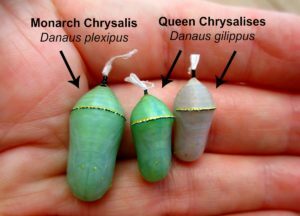 The chrysalis of the Queen is identical to that of the Monarch, but is typically smaller. Also, sometimes has a pink hue. The wings of the butterflies can be seen through the transparent pupal case shortly before eclosing. Like male Monarchs, male Queens have a black spot on each hindwing. These black dots are pheromone scales. Although Monarch butterflies do not use pheromones during courtship and mating, Queen butterflies do use them. The Queen has less prominent veins on its wings than the Monarch.